This visualization is a element of a presentation of a proposal, being presented by M/S Al-Ghurair Giga through Out and About™ advertising, to the City District Government, Karachi, Pakistan. The proposal is about the beautification of underpass with the picturesque tile overlay depicting historical infrastructure development in Karachi on the walls of the underpass. Modeled, textured and rendered in 3D Studio Max 7, and the animation of about 1:15 minutes took about 12 days continued on AMD Athlon 64 2.2 GHz with 1.0GB Ram, on PAL D-1 Specifications. 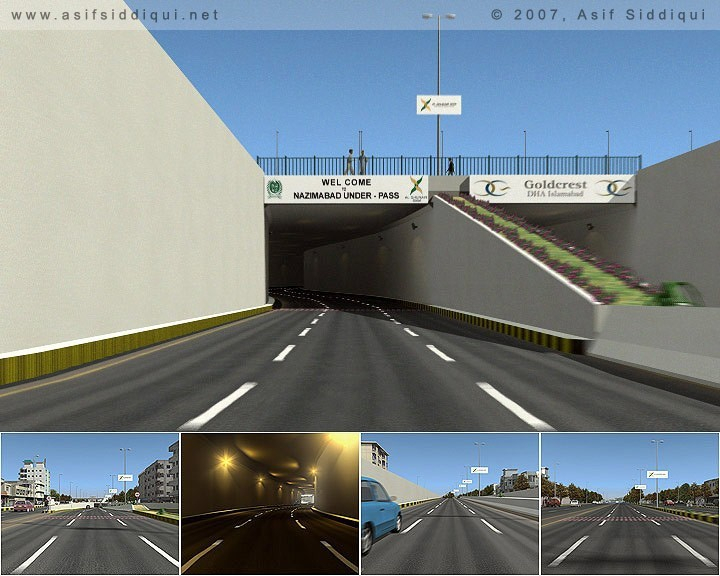 Please check [URL]http://www.sharecg.com/v/5793/animation/Nazimabad-Underpass-Drive-Through?division_id=2[/URL] for complete animation.